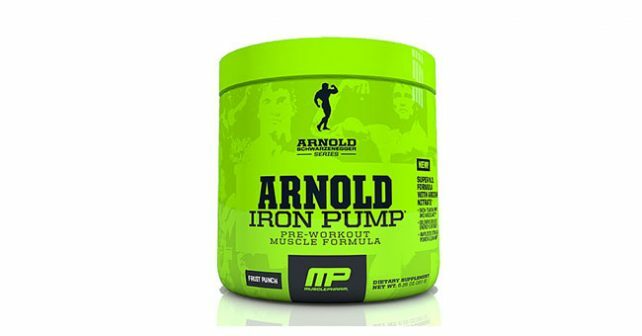 MusclePharm Arnold Iron Pump Review – Does it work? MusclePharm’s Iron Pump is pre-workout supplement that is supposedly designed to enhance your muscle pumps, workout intensity, and enhance your energy to endure your intense workout. MusclePharm tapped the influence of bodybuilding legend and former governor of California, Arnold Schwarzenegger to help market the product to a wider audience. Schwarzenegger endorsement is just one of many endorsement deals MusclePharm has with their own brand ambassadors. MusclePharm claims that the Arnold Iron Pump could enhance strength, power, and lean mass. The key difference that the Arnold Iron Pump has over majority of pre-workout supplements is the absence of Creatine or any other protein in the powder. Without creatine or any kind of protein, claiming that the Arnold Iron Pump can increase muscle mass may be misleading. In this review, we’ll take the Iron Pump apart to see if there’s a component in MusclePharm’s proprietary blend that helps build muscles. Just like any other supplement with caffeine as its main energy and mental alertness booster, the user would experience a quick response after taking the Arnold Iron Pump. However, the caffeine content is slightly higher than most people are used to, and it may lead to jitters, palpitations, angina, and hypertension. In some reviews, users encountered severe side effects of caffeine. It was also reported that many users experienced a sharp drop in energy levels just a couple of hours after taking the Arnold Iron Pump. Some users also expressed their concern over the taste of the product. In fact, majority of the critical reviews on a review aggregator website include complaints about the taste being intolerable. The absence of protein in the mix didn’t please many as well. Without protein, you cannot expect an edge in muscle mass development over people who do not take supplements for muscle mass. The absence of protein also tells us that the Arnold Iron Pump is not designed for fat burning or weight loss. It’s more targeted towards the energy bursts which would directly affect the intensity and endurance for weightlifting. Given these ingredient list, it’s clear that the purpose of the Arnold Iron Pump is all about strength and endurance. Still, the exclusion of Creatine and other protein types may be a bad decision on their part. Not having protein on this mix is really disappointing to say the least. If this was due to cost-cutting measures, or to promote product diversity, this was all done in bad taste. For all the ingredients that MusclePharm dedicated to increase pumps, it’s quite surprising that they did not include testosterone boosters in the mix. If you want a complete workout supplement, check out Xtreme Testosterone and NitroGenix 365.